A chunk of roadway at Valencia and Mission Streets would be reclaimed to create a plaza designed to make the corner more pedestrian-friendly and absorb stormwater under a project led by the SF Public Utilities Commission. 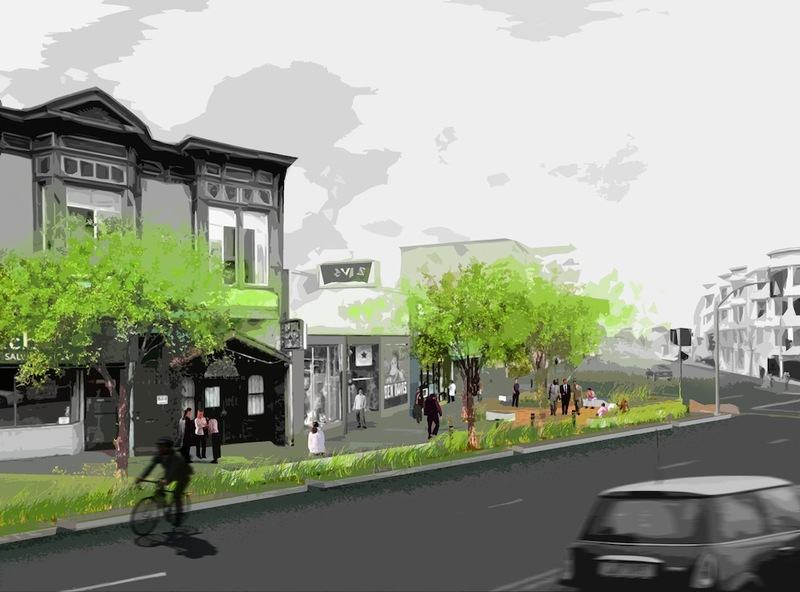 The Valencia and Mission Green Gateway Project would widen sidewalks and add greenery and permeable pavement treatments along the southernmost block of Valencia, between Mission and Duncan Street, where it also intersects with the Tiffany Avenue bike boulevard. Under designs presented by the SFPUC, the SFMTA, the Department of Public Works, and the SF Planning Department at an open house yesterday, the two right-turn traffic lanes on southbound Valencia at Mission would be converted to the permeable plaza, shortening a long crosswalk that currently crosses five lanes. The sidewalk would be expanded out to the existing refuge island. “We’re making traffic make more sense,” said Raphael Garcia, project manager for the SFPUC. The southbound end of Valencia would get a narrowed roadway, but an extension of the Valencia bike lane to Mission shown on an initial rendering for the project won’t be included, because that block is not part of an official bike route, according to Adam Gubser, a planner at the SFMTA’s Livable Streets subdivision. Instead, the block will retain two southbound traffic lanes so that Muni buses on the 36-Teresita line, which make a right turn there, aren’t delayed by car traffic waiting to turn, he said. Parallel parking spaces on the east side of the block would also be converted to back-in angled parking spaces to minimize parking removal. Altogether, ten parking spots would be removed for the project. 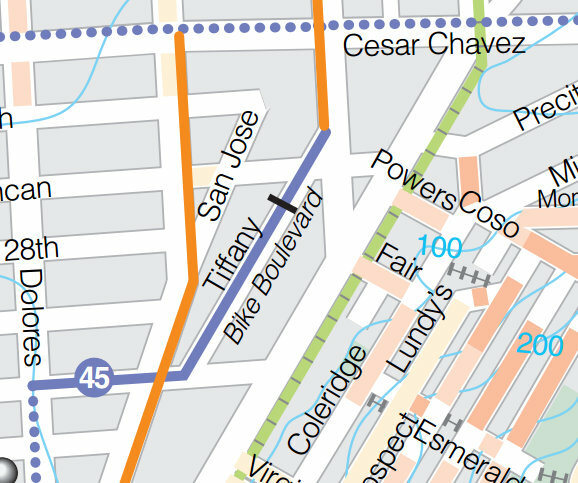 The official bike route instead directs Valencia bicycle riders west onto Tiffany, a designated bicycle boulevard, to connect to bike lanes on San Jose Avenue via 29th Street. The project would include greening and traffic calming improvements along Tiffany and 29th, he said, and the existing traffic diversion islands at Valencia and Tiffany would be adjusted to create an easier egress for bike traffic. Leah Shahum, executive director of the SF Bicycle Coalition, said the organization is “very excited” about the proposed improvements. “By including Tiffany Street and 29th Street, the city has the opportunity to create another neighborhood greenway stretching from the forthcoming Cesar Chavez green bike lanes to an improved San Jose Avenue,” she said. Gubser said residents on Tiffany have also launched a petition to convert their street from two-way traffic to one-way, with bicycles allowed in both directions. If a majority of residents sign the petition, he said, the conversion could be included in the project. Construction on the project is expected to take place through most of 2015. As the SF Bicycle Map (##http://www.sfbike.org/download/map.pdf##PDF) shows, the official route on Valencia diverts on to Tiffany before reaching Mission. Yes! There is very little detail in the sfwater handout; but it looks like they are planning green bike lanes + traffic lanes. This street sees very little traffic and could be a good candidate for a shared lane with more green space. This article seems to imply the bicycle route through Tiffany is a bad “diversion”. Tiffany provides a simple, bike-friendly route to the San Jose cut and access to Glen Park. It should be encouraged (e.g. having green bike lanes deadend at Mission is confusing). That’s where I got doored last night! Jimmy – what if you aren’t headed to the San Jose cut or Glen Park? I use this intersection frequently because my destination is on Mission South of this spot. Yeah I had asked the MTA planner there, forget his name, about what they planned to do to connect 29th up mission to Cortland. He said there are no plans and that “Mission is its own beast”, and that when he lived in Bernal he “biked Mission all the way to downtown because it’s faster” – so there’s the mindset for ya! I even asked about sharrows for 2 blocks – as lame as they are – and he said that wouldn’t even happen. Our local post office is on Tiffany St. Restricting it to one-way traffic is a bad idea especially if you can not drive Tiffany to Duncan St or the reverse. There are already enough bike lanes in the neighborhood, which are seldom used. Designating more is a bad idea. The current Valencia/Mission intersection does need help. I like any and all of the proposals to create a more 90 degree junction there. Paving and landscaping would also improve the overall appearance. Forget the bike lanes since they do not continue onto Mission Street and wouldn’t want them to. Open up Duncan Street to Tiffany and Valencia. The situation now causes congestion, lack of traffic flow and difficult access to our neighborhood post office.